With the arrival of winter soon upon us, Wynn Macau and Wynn Palace Cotai will partner with award-winning chefs to present the tremendously successful ‘Wynn Guest Chef Series’ for a third time. Also, signature restaurants at Wynn Macau and Wynn Palace will present a very special selection of winter seasonal dishes designed to warm the soul from December through February 2019. First listed as the “One to Watch” in 2016, Tokyo’s Florilège in Aoyama to rank 3 rd on Asia’s 50 Best Restaurants list in 2018. At the helm of Florilège is Chef Hiroyasu Kawate, who also successfully led his restaurant to receive two Michelin stars from the Michelin Guide Tokyo 2018. As one of the most highly respected chefs in Asia today, Chef Kawate will use Mizumi at Wynn Palace as his stage to create imaginative modern French cuisine with the freshest and highest quality of Japanese ingredients. Chef Ivan Li, of Family Li Imperial Cuisine received the Lifetime Achievement Award from the2014 Asia’s 50 Best Restaurants Awards and is one of the most sought-after Chinese chefs in the country. He is the second generation of the Family Li Imperial Cuisine restaurant and will fittingly work with Chinese Executive Chef Liu Guo Zhu, who also oversees Golden Flower which preserves the rich traditions of Tan cuisine. Together, they will present the essence of Qing Dynasty court cuisine. Chef Li strictly follows his ancestral training, while also blending contemporary culinary ideas to carry on the traditions of Li Imperial cuisine. As with Tan cuisine, the finest ingredients are used with the most delicate of cooking methods. For nine consecutive years, Sushi Saito has received three Michelin stars from the Michelin Guide Tokyo and in 2018, was ranked #27 on the Asia’s 50 Best Restaurants list. The chefs at Sushi Saito go to extraordinary lengths to source the best ingredients to create sushi that balances texture, temperature and flavor. Sous Chef Shunji Hashiba, of Sushi Saito will be stationed at Sushi Mizumi at Wynn Palace, where he will present a variety of expertly sliced sashimi and Edo hand-held sushi for guests to savor. The Michelin Two-Star and Forbes Travel Guide Five-Star award-winning restaurant Golden Flower features Tan cuisine which dates back to the late Qing Dynasty when a government official, Tan Zongjun served the best of northern and southern Chinese cuisines to the elite in China. Golden Flower also specializes in traditional Lu and Sichuan cuisines which are perfect for the winter months as well. Golden Flower will present two lamb dishes which are designed to warm the soul. The first is the Sichuan Style Braised Mongolian Lamb Chops and Chili Sauce with Garlic and Vegetables. The lamb chops are specially selected from the Inner Mongolian grasslands, where the meat of the lamb is tender and juicy. The lamb also has a hint of spice and is cooked in a clay pot. Another highlight is the Deep-fried Spice-Flavored Te Mana Lamb Ribs. These delicious New Zealand lamb ribs are full of flavor and sliced right at the table for guests to see. Wing Lei, the Michelin one-star and Forbes Travel Guide five-Star award-winning restaurant will introduce a special truffle dish featuring the flavors of East and West this winter. 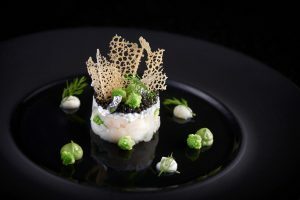 The team of chefs have created Scrambled Egg White with Lobster and Broccoli Served with Shaved Black Truffle, which features a beautiful blend of fresh lobster, Italian black truffles and fried Australian broccoli with ginger sauce. The team of chefs at Ristorante il Teatro will also be on stage in their beautiful open kitchen to present a very special Hokkaido Scallop Tartar in honor of winter. This dish features Hokkaido scallop tartar, stracciatella, Oscietra caviar, Romanesco florets, cauliflower cream, green pea puree and dill. The Hokkaido scallop are from the Sea of Okhotsk which is rich in nutrients, allowing the scallops to grow larger and sweeter. The Oscietra caviar from Kaluga Queen blends beautifully with the cauliflower cream and green pea puree. SW Steakhouse is renowned for its prime meat and succulent seafood as well as its captivating theatrical dining experience. This winter, the team of chefs at SW Steakhouse are offering Wagyu Braised Beef Cheeks which are slow braised for eight hours. The tender, wagyu beef cheeks are then glazed with pomegranate molasses, served with charred carrot and spiced rice featuring aromas and flavors that are out of this world. From December 17, 2018 to February 28, 2019, the luxurious Wing Lei Palace is presenting an authentically Cantonese dish to warm the soul this winter – Braised Fish Maw, Sea Cucumber and Guinea Fowl Soup. For centuries, this soup has been enjoyed by imperial families. In keeping with tradition, this dish will be prepared in the same classic way, but rather than using snake meat, guinea fowl will be used. Together with fish maw and sea cucumber, this soup will be a wonderfully nourishing winter for guests to enjoy. Wynn Macauis a luxury hotel and casino resort in the Macau Special Administrative Region of the People’s Republic of China with two iconic towers featuring a total of 1,008 spacious rooms and suites, approximately 273,000 square feet of casino space, over 59,000 square feet of retail space, eight casual and fine dining restaurants, two spas, a salon and a pool. The resort proudly boasts three distinct entertainment experiences, including Macau’s only choreographed Performance Lake, blending lofty plumes of water, gracefully choreographed music from Broadway tunes to renowned Chinese songs, powerful LED lights and fire effects.